This great quality golf package set is ideal for new and improving golfers. Incorporating the latest in golf club design, these clubs are built to be easy to use, forgiving and straight. The oversize 460cc driver (the biggest legally allowed) has a huge sweetspot, meaning even when you don't quite get it out the middle, you'll get longer, straighter shots than clubs with a smaller sweetspot. Matching headcover included. The 15° #3 fairway wood, though smaller than the driver, still has an enlarged sweetspot for greater forgiveness. The low profile sole makes it ideal for hitting off the grass without a tee - exactly what you need if you are going for the green on a par 5! Matching headcover included. 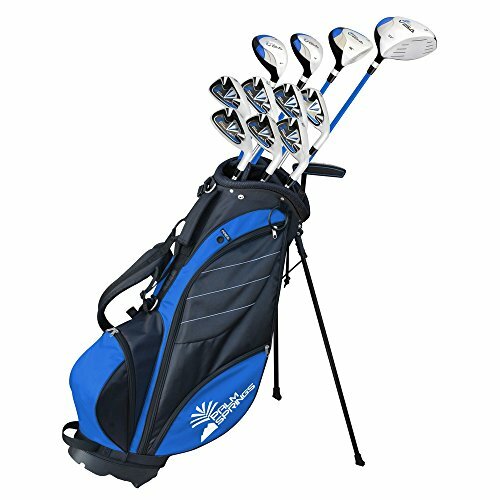 This golf club set includes 2 hybrids - a #3 (18°) and #4 (21°). These clubs replace the longer irons in your bag - typically they were the hardest to hit - and instead give you clubs you'll look forward to hitting. Whether it's long approaches from the fairway, or getting out of a tricky situation in the rough, these will become your go to clubs. Matching headcovers included. The 6 irons 5-6-7-8-9-PW all feature a cavity back design, which creates clubs with a higher MOI and lower centre of gravity - this all means the clubs are more forgiving and more consistent - exactly what is needed when you are still developing your swing. Fitted with steel shafts. The putter completes the clubs. The unique head shape helps put more mass behind the point of impact for a more reliable and solid roll. The set includes a deluxe stand bag. The 7 way divider top helps keep your clubs organized, and the ample pockets provide storage space for balls, tees, waterproofs and more. Complete with a dual carrying strap and a rainhood.